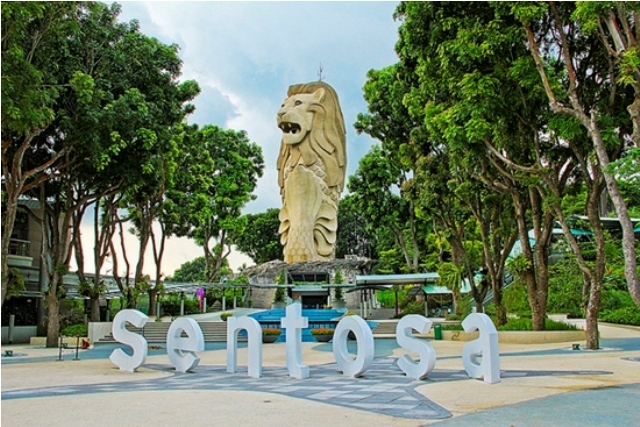 The famous Sentosa Island has a rich history. Its location was important in protecting the waters of Keppel Harbour, and that’s why some forts were built on it. The island then became a military fortress maintained by the British during World War II. When Singapore became independent in 1967, the island was used as a naval base. Eventually, the island was developed into a resort to attract local and foreign tourists, and its name was changed from Pulau Belakang Mati, which in Malay means the island after death, into Sentosa, which means tranquility. Today, it has been developed into one of the most beautiful, must-see places in Singapore with so many interesting sights. If you mention the word Singapore, one of the things that come to mind is the Merlion, a famous icon of the Lion City. Its upper body is that of a lion while its lower body is that of a fish. A 37-meter high Merlion stands in Sentosa Island, and behind it is a walkway that stretches for 120 meters. Called the Merlion Walk, this mosaic walkway was inspired by the designs of Spanish architect Antoni Gaudi. You can enter the Merlion for a small admission fee of $8, and you can traverse the Merlion Walk for free. If you are a nature lover, be sure to visit the Butterfly Park and Insect Kingdom. Situated amidst lush green vegetation, this park is home to different species of butterflies and other insects and birds. You should not tour the park in haste or you will miss the colorful creatures. Take your time and be careful to observe the animals in their natural habitat. Admission fee for adults is just $16 and for children aged 12 years and below is $10. Near the park, you will find the station for the newly renovated Cable Car that connects Sentosa to the mainland. The Cable Car is one of the ways by which visitors can access Sentosa. It has 81 cabins that are designed with transparent walls, allowing passengers to take in the breathtaking views of the southern part of Singapore from all angles. Adult fees for the ride are $24 one-way and $26 two-way. These already include the entrance fee to Sentosa Island. While you are on the island, go for the rides of your life with the Sentosa Luge and Skyride. Board a luge and choose between the 650-meter Jungle Trail or the more challenging 688-meter Dragon Trail. You can go as fast or as slow as you like. Instructors are present to advise you how to maneuver the luge. If you don’t want to be on the road, then be above it. The Skyride is an open-air chairlift cable ride that will show you the beauty of the beaches and other sights over the horizon. Another attraction on the island is the Tiger Sky Tower, a 131-meter high observatory tower – the highest in Singapore. At the top of the tower, there is an air-conditioned cabin where you will see not just Sentosa but also mainland Singapore and even a bit of Indonesia and Malaysia. Admission fees are only SGD$15 for adults and SGD$10 for children. Your visit to Sentosa will not be complete without going to the beaches. There are three beaches on the island: Siloso Beach, Palawan Beach, and Tanjong Beach. Siloso Beach abounds with free volleyball courts, restaurants, bistros, and themed bars. If you enjoy parties and music, then this is the place to be, especially at night. Palawan Beach is famous for the suspension bridge that connects it with a smaller island. This island is said to be Asia’s southernmost tip, the part that is closest to the equator. Palawan Beach also has some bars but it is relatively quieter than Siloso Beach. Tanjong Beach is the most secluded beach in Sentosa Island and is therefore preferred by those who really like it quiet. Tanjong Beach is shaped like a crescent. Because it is secluded, the place is sometimes rented for private parties and other events.